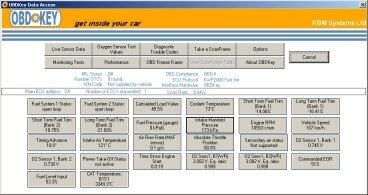 OBDKey WLAN is a vehicle interface providing a WiFi / Wireless Lan / WLAN radio interface for devices that have a WiFi compatible system. Software supplied with the OBDKey WLAN unit will work with Windows PC's and Windows Mobile devices which support a wireless LAN interface. Third party software is available for Apple iPhones and iPod Touch devices. Plastic case: Single case design. Automotive Grade resins and silicones. This is the same software as supplied with the OBDKey Bluetooth and OBDKey USB devices. For iPhone and iPod Touch support, we have tested successfully with the DevToaster Rev software product. OBDKey WLAN will work without modification with the DevToaster Rev. Note that the DevToaster Rev software must be purchased seperately via the Apple AppStore. WiFi: The OBDKey WiFi connects with any 802.11b/g wireless network and can connect to another WiFi module, laptop, notebook and any 802.11b/g compatible device. WiFi: Supplied with IP address, port number and SSID for simple configuration as an ad-hoc network. Infracstucture (via an access point) mode is also supported. Mechanical Add-Ons: There are no "bolt-on" parts. The OBDKey WiFi is a single self-contained unit. Cables: There are no cables at all. 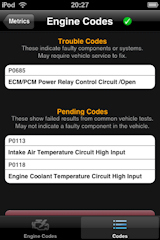 The OBDKey WiFi is a single self-contained unit which plugs directly into the vehicles J1962 OBD-II port connector. Extended command set so that OBDKey can perform enhanced diagnostics not possible with simple ELM based scan tools. 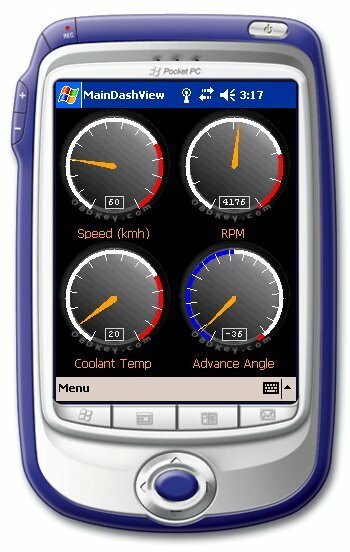 However, OBDKey is compatible with the legacy ELM327 command set which means you can also run ELM based applications with the OBDKey device range. Upgradeable firmware. Updates available to add new features to the already stable and well proven OBDKey core firmware. Keeping your OBDKey adapter up to date and protecting your investment. Battery saving technology which prevents the OBDKey from keeping the vehicle ECU systems awake for longer than is really needed. Regular battery checks should be carried out if you leave any device permanently connected to your vehicle. Super advanced multi-protocol auto-detect processes. Further custom protocol support also available. 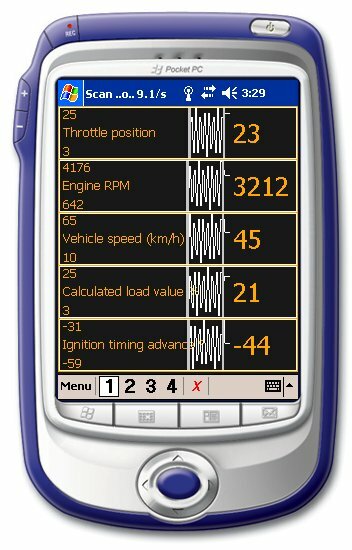 OBDKey connects to more OBD-II and pre-OBDII vehicles than any other scan tool adapter on the market in this class. 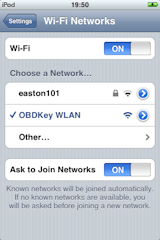 The OBDKey WLAN is capable of working in ad-hoc and infrastructure (via an access point) modes. In ad-hoc mode the OBDKey WLAN will create a wireless LAN network with a new SSID for other devices to detect and connect to. Please add me to the OBDKey WiFi mailing list. Do you have any questions?